From where I stand, the most crucial things the Pilgrims have to say to us have nothing to do with Thanksgiving itself. For one thing, the Pilgrim ideal throws into bold relief the supreme individualism of modern American life. The Pilgrims saw the world in terms of groups—family, church, community, nation—and whatever we think of their view, the contrast drives home our own preoccupation with the individual. It was with Americans in mind that French writer Alexis de Tocqueville employed the term later translated as “individualism,” and the exaltation of the self that he observed in American society nearly two centuries ago has only grown relentlessly since. 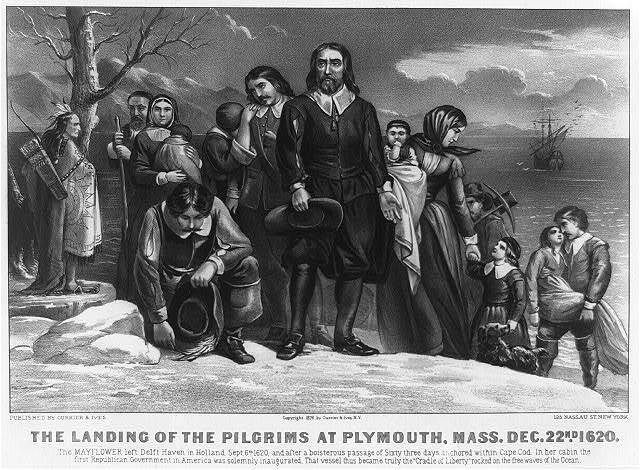 I think that meditating on the Pilgrims’ story might also show us our worldliness. “Do not love the world or the things in the world,” John the Apostle warns, referring to the hollow rewards held out to us by a moral order at enmity with God (I John 2:15). From our privileged perspective the Pilgrims lived in abject poverty, and imagining ourselves in their circumstances may help us to see more clearly, not only the sheer magnitude of pleasure and possessions that we take for granted, but also the power that they hold over our lives. But for many of us the seductiveness of the world is more subtle than Madison Avenue’s message of hedonism and materialism. God has surrounded us with countless blessings that He wants us to enjoy: loving relationships, rewarding occupations, beautiful surroundings. Yet in our fallenness, we are tempted to convert such foretastes of eternity into ends in themselves, numbing our longing for God and causing us to “rest our hearts in this world,” as C. S. Lewis put it in The Problem of Pain. Here is where the Pilgrims speak to me loudly. It is not their poverty that I find most convicting, but their hope of heaven. When I was three years old, my proud father, who was superintendent of the Sunday School in our small-town Baptist church, stood me on a chair in front of his Bible class so that I could regale the adults with a gospel hymn. (I know this because my mother was so fond of remembering it.) “When we all get to heaven,” I lisped enthusiastically, “What a day of rejoicing that will be. / When we all see Jesus, / We’ll sing and shout for victory.” On the whole, I don’t think American Christians sing much about heaven any more, much less long for it. I know that I do not, and I don’t think I’m alone. After decades of talking with Christian young people about the afterlife, Wheaton College professor Wayne Martindale concluded that, “aside from hell, perhaps,” heaven “is the last place we . . . want to go.” This should give us pause, shouldn’t it, especially when we recall how largely heaven figures in New Testament teaching? “Lay up for yourselves treasure in heaven” (Matthew 6:20), Jesus taught His disciples. On the very night He was betrayed He promised His followers that He would prepare a place for them and asked the Father that they might “be with Me where I am” (John 17:24). Paul reminds us of this “hope which is laid up for [us] in heaven” (Colossians 1:5). Peter writes of the “inheritance incorruptible and undefiled” that the Lord “has reserved” for us there (I Peter 1:4). There are surely many reasons why we find it so hard to “set [our] minds on things above” (Colossians 3:2), including our misperceptions of heaven and our fear of the unknown, but one reason must also be how well off we are in this world. If “churchgoing Americans . . . don’t much want to go to Heaven,” Martindale conjectures, it may be because we feel so “comfortable” on earth. Our creature comforts abound, and for long stretches of time we are able to fool ourselves about the fragility of life. Modern American culture facilitates our self-deception through a conspiracy of silence. We tacitly agree not to discuss death, hiding away the lingering aged and expending our energies in a quest for perpetual youth. 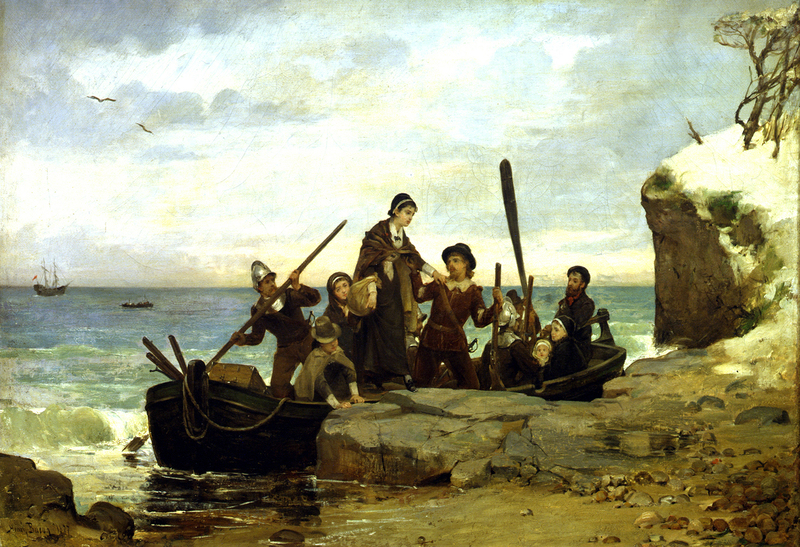 “The Landing of the Pilgrims at Plymouth,” Currier & Ives, 1876. Rather than amounting to a form of escapism, “aiming at heaven” might actually enable us to see both ourselves and the world around us more clearly. To begin with, to know we are pilgrims is to understand our identity and, by extension, where our ultimate hope lies. This is something we struggle with, in my opinion. American Christians over the years have been tempted to confuse patriotism and piety, confounding our national identity as citizens of the United States with our spiritual identity in Christ. We are to “be subject to the governing authorities” (Romans 13:1), Paul enjoins us, and yet never forget that “our citizenship is in heaven” (Philippians 3:19). We should thank God daily for the blessings he has showered on our country, but to know we are pilgrims is to understand that our hope of “survival, success, and salvation” rests solely on our belonging to Christ, not our identity as Americans. In contradiction to this truth, American culture calls us to be “well-adjusted citizens of the Kingdom of this world,” as Christian philosopher Peter Kreeft trenchantly observes. We who name the “name above all names” have all too often acquiesced, in part by convincing ourselves that, given America’s “Christian culture,” there were no hard choices to be made—that our religious and national identities were mutually reinforcing, if not downright indistinguishable. But if knowing we are pilgrims means that our true citizenship is in heaven, it also means that we are “strangers” and “aliens” here on earth—yes, even in the United States—and this means, in turn, that we should expect the values of our host country to differ from those of our homeland. American Christians have adopted numerous ploys to obscure this reality, but one of the most influential has been the way we have remembered our past. One example of this is how we have distorted the Pilgrims’ story, clothing them with modern American values and making the future United States—not heaven—their true promised land. “. 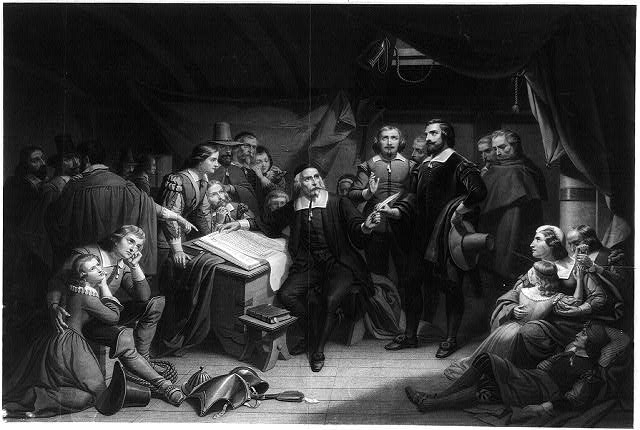 . . From where I stand, though, the most crucial things the Pilgrims have to say to us have nothing to do with Thanksgiving itself. 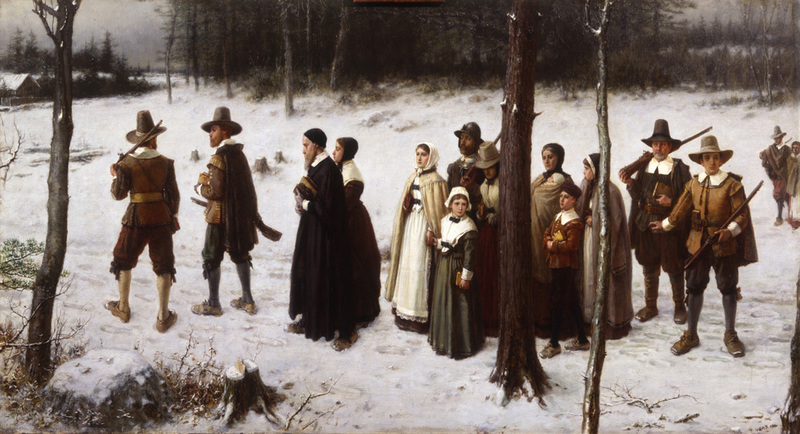 Far more important than its indictment of the holiday, the Pilgrim ideal throws into bold relief the supreme individualism of modern American life. The Pilgrims saw the world in terms of groups—family, church, community, nation—and whatever we think of their view, the contrast drives home our own preoccupation with the individual. It was with Americans in mind that French writer Alexis de Tocqueville coined the term later translated as “individualism,” and the exaltation of the self that he observed in American society nearly two centuries ago has only grown relentlessly since.
. . . 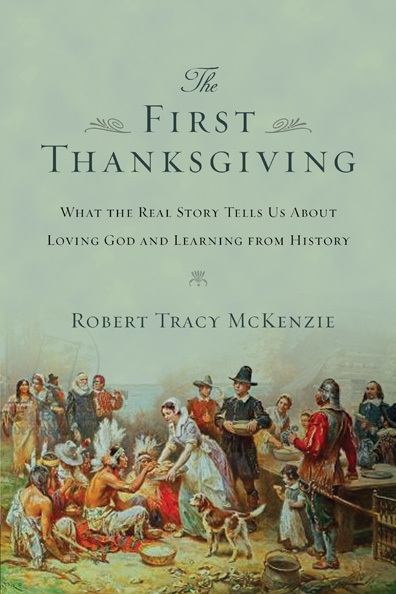 I think that meditating on the Pilgrims’ story might also show us our worldliness. “Do not love the world or the things in the world,” John the Apostle warns, referring to the hollow rewards held out to us by a moral order at enmity with God (I John 2:15). From our privileged perspective the Pilgrims lived in abject poverty, and imagining ourselves in their circumstances may help us to see more clearly, not only the sheer magnitude of pleasure and possessions that we take for granted, but also the power that they hold over our lives.